Hillary Clinton's original description of her arrival at Tuzla airport in Bosnia was vivid and thrilling and entirely at variance with what really happened. She spoke, for example, of how a welcoming ceremony had to be abandoned as sniper fire forced members of her official party to run for their lives. 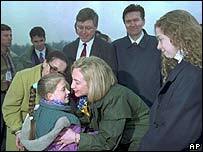 "I remember landing under sniper fire," she said. "There was supposed to be some kind of a greeting ceremony at the airport but instead we just ran with our heads down to get into the vehicles to get to our base. "But it was a moment of great pride for me." Unfortunately for Senator Clinton plenty of television footage has survived, showing the actual circumstances of her arrival, which were very different. She smiled and waved as she left her aircraft and then strolled across the airport tarmac to greet a little girl who read her a poem. "I did mis-speak the other day. You know this has been a very long campaign [laughs] so occasionally I am a human being like everybody else." The word "mis-spoke" is a a useful one in this context implying, as it does, that something which feels like a lie is really little more than a slip of the tongue. 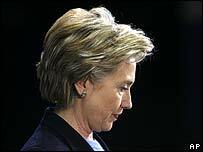 Still the Tuzla affair is politically damaging for Senator Clinton. It helps her rival Barack Obama reinforce his point that she is prone to exaggerate the value of her service as First Lady in her quest for the presidency.